Valentine’s day is inextricably linked with flowers. It’s a celebration of romance in the UK but in other countries it’s a celebration of friendship and kindness. Understandably there is often some backlash against the commercial pressure of the day however it is a chance to highlight the environmental cost of some flower production and I am very pleased that information about intensively farmed roses flown in from Africa is becoming better known. I also even understand some criticism for the unimaginative dozen red roses choice, however for me flowers will always be the only choice. Really it’s easy to steer away from the classic red rose bouquet by maybe trying a bunch of luxury white roses, or embellish the gift by combining your blooms with an elegant vase or perhaps a fun hat box and that way your loved one will be left with something to remember the occasion by and be able to refill it in the future. But by far the best choice for me is seasonal flowers. These are the most special blooms as they the ones which are flowering right now and fit in with what is going on around me. It’s like the first strawberry of summer on a hot sunny day or the sip of steaming mulled wine at an outdoor Christmas market. Not only can you savour the moment but you’ll always have something to look forward to. Plus by choosing a locally grown as well as seasonal bunch you can be kind to the environment too. Here is a bunch of 5 different varieties of hellebores including an unusual and bizarre black one. 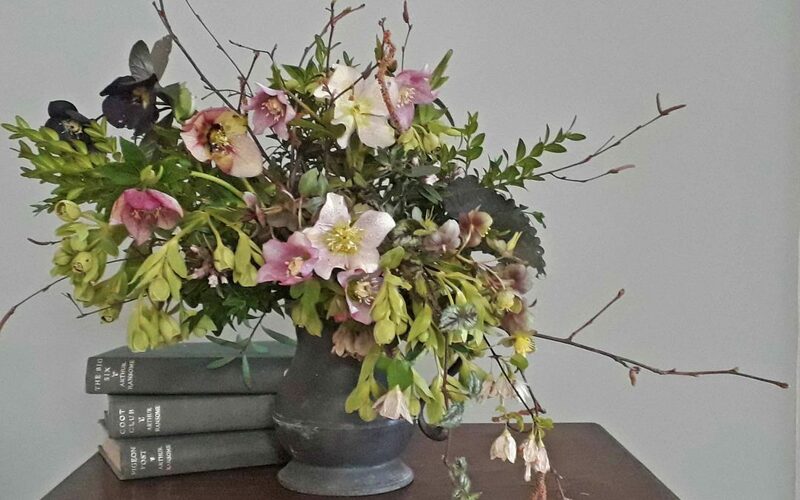 (Hellebores definitely need searing in boiling water for 10 seconds if you are cutting them from your garden as they tend to flop otherwise). The foliage is box, hebe and daphne and is combined with twigs.Seasonal and gorgeous in my book. 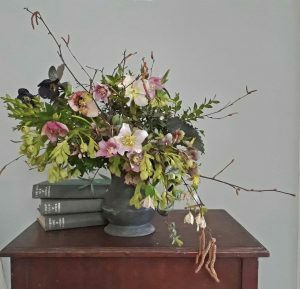 Winter flower bouquet of Hellebores with catkins. Bulbs – The Perfect Plant?